Shazam! is an interesting superhero film. The characters origins going back to when he was originally being called Captain Marvel, before DC would later change his name to Shazam! feels rather ironic and appropriate given that his film was now coming out mere weeks after Captain Marvel. Shazam! has had a rather troubled history as a film, it was originally announced as part of DC’s plans going forward but after Justice League, the franchise of the DC extended universe is all over the place. With Aquaman’s success, however, there did seem like there was some life in the project, but it doesn’t change the fact that DC still does not have a clear plan for these films going forward. Shazam! is hopefully going to put things back on track since as a DC fan boy, I would really like to see DC have some success again and be a genuine rival to Marvel. With Shazam!, however, they were running into a few problems; for one thing, he’s not exactly the most popular character, he’s had some decent appearances, but outside of DC knowhow, not many people really know him per se. Secondly, he hasn’t really been that much involved in the comics line for DC fans, so yeah, he’s been rather out of the DC universe for quite some time making only sporadic appearances. In the director’s chair, we have David F. Sandberg, who was an odd choice initially since he is mostly a horror director, having directed films like ‘Lights Out’, which I really enjoyed and Annabelle Creation, which I haven’t seen but I’ve heard good things about and in the writing chair, is Henry Gayden, who’s IMDB page is rather stark, this being his first major production as a writer. Now as a DC fanboy I know the origin story of Shazam! quite well, but of course, he is not that well known. 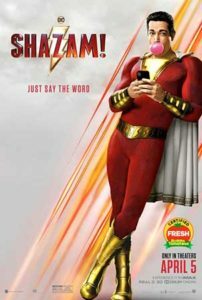 The story is of a 14 year old Billy Batson, played by Asher Angel, a foster child who is looking for his mother when he is taken in by a foster family and befriends a young kid named Freddy, played by Jack Dylan Grazer and one day after defending them from bullies, he runs onto a subway train, where he is approached by the wizard Shazam!, played by Djimon Hounsou, who imbues him with power to stop a group of demons that represent the seven deadly sins, that have imbued power to Dr Thaddeus Silvana, played by Mark Strong, when saying the wizard’s name, he gains the power of the superhero Shazam!, which transforms him into a more adult version of himself, played by Zachary Levi. From there, it’s your prototypical superhero movie. Now people who are familiar with DC’s new 52 storyline, will know mostly what’s going on here because the film borrows very heavily from that storyline, in fact it’s almost note for note. Rather like that one and rather fortunately, Billy is not exactly the pure of heart kid that he is in the 40s, in this storyline, he is not as much of an arse as he is in the comic storyline initially, but he is still not exactly the best behaved kid but honestly I think this is a change much for the better, as it makes him seem more human. The biggest difference from the comic storyline to the film is the villain, in the comic it’s Black Adam, who was initially announced to be the villain and was going to be played by Dwayne “The Rock” Johnson, it’s now been changed to let Black Adam have his own film because DC is obsessed with villains, we’ll see if that gets off the ground! Dr Silvana is actually an interesting new choice and I actually think it kind of works out better. For one thing, Black Adam might be the reverse of Shazam!, but he would have had to have established a lot more about the character including the nation that he rules and the plight of his character and by doing it this way, it allows Shazam! to remain the focus but Silvana works out as a great villain because he represents the opposite of Billy, they have very similar back stories and they have similar attitudes towards the power and surprisingly Zachary Levi and Mark Strong do a good job playing off one another. Now Silvana is not the most compelling of villains since he is kind of a power for the sake of power, however, I’ve seen a lot worse and hell, some Marvel villains have been a lot blander than this, although that being said, when the focus is on Shazam! and his friendship with Freddy, it is actually some of the best stuff in the film. You get a sense that Zachary Levi and Asher Angel have spent a lot of time together because Zachary Levi really does a good job playing a sort of version of himself in a grown up body, in fact, a lot of people are going to make a lot of comparisons, well it’s ‘Big’ if ‘Big’ was a superhero, in fact there is actually an homage to ‘Big’ during one of the action scenes and also both actors do a great job playing the role that they are put in and the film does a really good job introducing Shazam!, his world, his powers, the various aspects of him and they don’t do too much of a job trying to tie into the DC Cinematic Universe, there are only a few references to Superman, Batman and Aquaman. How Shazam! is going to fit into all of this is another matter, but at least this is one film where they at least make sure to get the main character down and do a film that would work fine as a solo film, then try to build the universe around it, rather than the other way around. Shazam! however, also really does make a good job of its primary focus, in fact there were several factors I wasn’t expecting to turn up in this film, including one aspect of it that I suspected that they were saving for the sequel, but man was I glad of its inclusion, but to avoid spoilers, I won’t be going into it. The film also does a decent job trying to reflect the YouTube phenomenon idea with much of Billy testing his powers being recorded by Freddy and being uploaded to YouTube. Now, it’s one of those films where you obviously know this hasn’t been shot on a phone camera, but I really like the nature of these, even if a few of these references might date the film horribly. Most notably, the references to Fortnight and possibly Game of Thrones. Ok, I will now talk about the action scenes which are really damn good, they make excellent use of Shazam!’s powers, they are well shot, well-paced and rather like Marvel, they are also lighter in tone. DC has clearly been looking at what Marvel’s success has been and making the most of it. The action is also superb, I have already gone on about Zachary Levi, but Mark Strong is also really good as well as excellent performances from almost the entire cast. It is also one film where the young actors, like Faithe Herman, Ian Chen, Grace Fulton and Jovan Armand are some of the better young performers in recent memory and even some of the extra performances that I won’t dare give away but as the cast goes, they actually do a really good job. There is even an excellent performance from John Glover in a role that looks as though it could feel wasted if he didn’t give such an amazing performance in the scenes he had. Ok, I’ve gone on about what’s been good about the film, I will be fair and say there are a couple of things that stop me from saying that I think this film is the best DCU film so far, the major one being that the middle act feels like it drags on a little bit and there are few clichés I wish could do without, for example the one dimensional bullies and the obvious revenge fantasy that comes with some of these superhero films, things like that can really drag the film a little bit, but the film really makes up for it in the third act. This film also has one of the best final fight scenes in recent memory. Shazam! is one of the better DCU films in recent memory and it would probably be the best film if Wonder Woman wasn’t a thing. Shazam! ultimately has great appeal, a great cast, a brilliant story and introduces the character well into the modern world. I seriously hope he ends up in the next Justice League film if that ever gets made. Everyone is well suited to it, everyone is well acted, and the fight scenes are well choreographed and make use of the powers very well. It is one of those films you really have to see. DC fans will get a lot out of it and I think even some of the Marvel crowd might start to appreciate it. Comic fans should apply, and superhero fans should definitely apply to see this. Well, that’s it for another week for me and since I am done with Shazam!, it’s time to move onto the next, in what has inadvertently seems to have become a month of mainly comic book movie reviews, so I will be moving on next week to the reboot of “Hellboy”. With all that being said, thanks for reading this review, I hope you have enjoyed reading it as much as I enjoyed writing it.